Welcome! 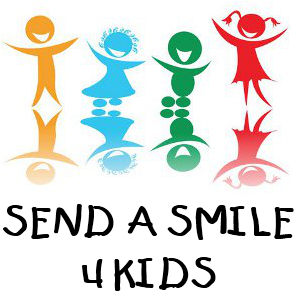 This week I have been given the honor of being asked to be a Guest Designer for Send A Smile 4 Kids http://sendasmile4kids.blogspot.com/. This week their theme is From a Kid. Isn't he adorable? He reminds me of my son when he was just a wee one, clunking around the house in his Daddy's shoes, that was a long time ago as my son is now 17! This will be a Fathers Day Card for my Hubby from my son. At least one card is done early! Image; Milk Coffee "In His Shoes"
Be sure to enter their From a Kid challenge this week! Adrienne this is so cute! I really love that postage stamp cut and the way you've angled the pieces. The image is sweet as can be and your coloring is wonderful! Thanks for playing in Squigglefly's challenge once more! This is real cute and love the sentiment. TFS with us over at Eclectic Ellapu this week. Sooo adorable, totally loving all those fabulous layers. To cute!!! Love your design!!! Fantastic project, so sweet and true! Thank you for joining us at the Celebrate the Occasion challenge and hope to see you back again. Fab project Adrienne! Love the die cuts and layout. 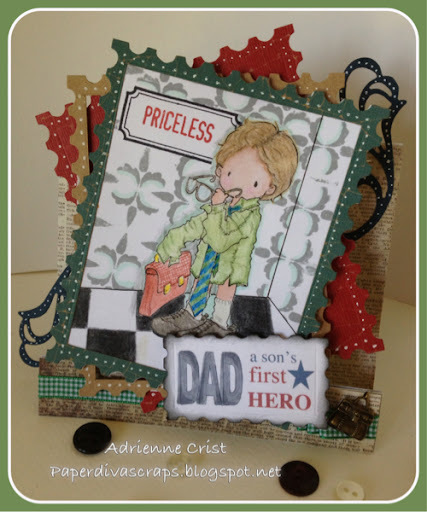 I can tell you made real nice Card, thank you so much for sharing with bastel-traum.ch! Tom. oh this is a brilliant masculine card Adrienne!!! A very beautiful card. I love the cute image. Thanks for joining us at bastel-traum.ch. Love your card design. Great coloring too! Thank you for joining us at Color Me Creative. Hope to see you again! Wow, layers layers layers! Nicely done! Thanks for entering at Drunken Stampers! What a lovely card you've created and for such a good cause. Bravo you! Thanks so much for joining us at Our Creative Corner this time.